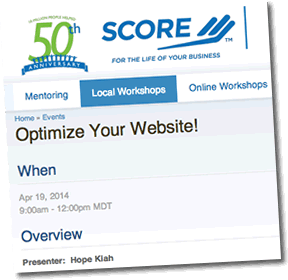 This hands-on, interactive workshop was sponsored by Santa Fe SCORE and designed for businesses that have – or plan to develop – websites. Participants discovered the keywords which their ideal customers search in Google, and how to incorporate them into their websites, using search engine optimization (SEO). I have done many workshops with SCORE. They are always a hoot and extremely helpful for attendees.